Even if you have an army of nannies, chefs and drivers, YOU are still the mother first and foremost and it can still tough. Your fundamental identity changes overnight and we need to acknowledge that although Motherhood is a wonderful thing, it is not always that easy. 2 in 10 women can suffer mental health issues during pregnancy or postnatally. Many of these women suffer in silence as they are so worried about admitting they are struggling. Conversations are crucial for mental wellbeing – so if you are struggling, please try and start a conversation with your friends, your partner, your care provider and that’s a great step towards getting better. 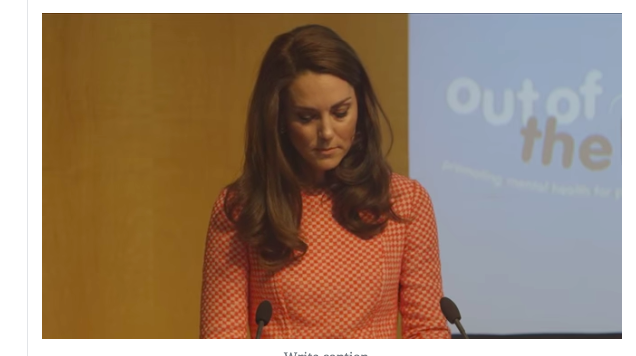 The Duchess of Cambridge is passionate about Maternal Mental Health and this speech is testament to that. She is working with Heads Together on a very important campaign called Out of The Blue. For more information on your mental health during and after pregnancy, to hear about the signs and symptoms of Postnatal Depression, and the commonplace 3rd Day Blues, do sign up for our Online Antenatal Classes.